There are two new faces you may be seeing or hearing from this summer, so I’d like to formally introduce them and tell you a little bit about what they’re doing at Peirce. Meet Norman Wallace and Jasmine Nicole Ross, our summer interns. 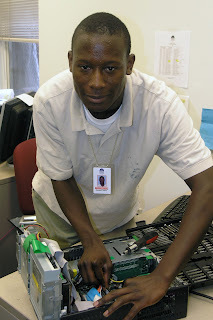 Norman, a rising senior at South Philadelphia High School, is working in our IT Department where he will shadow technicians and work on everything from support calls and troubleshooting to operating system installations and application development. This opportunity will provide him with hands-on experience that is hard to find in the IT field. Today, it is not uncommon for work experience, education and certifications to be expected of all candidates. Many companies look for IT interns who already have a number of IT or technology courses under their belt, which makes it difficult for young students to meet the requirements needed to even be considered for their first internship. That’s why we felt that opening our doors to a student who’s just getting started was important. Hopefully his experience will set him apart from his peers and open doors down the road. You can contact Norman via e-mail. 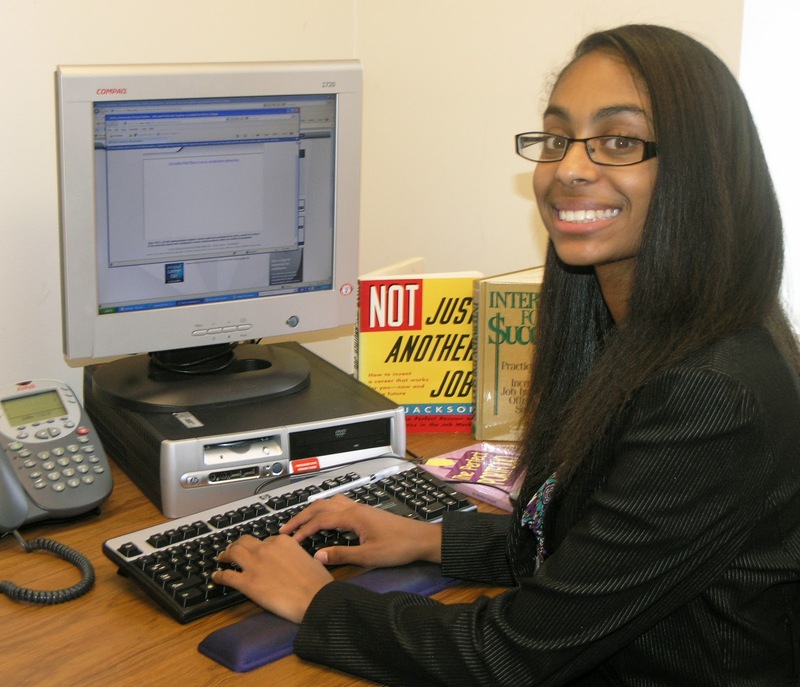 Jasmine is a rising sophomore at Central High School and is working in the Career Development Services (CDS) Department. Jasmine is still considering a number of different paths for her future, but the bottom line is she knows she needs real-world experience. One of her major responsibilities will be researching different career-related articles to find topics of interest, both from her perspective and that of our students, to share here on Peirce Connections. Jasmine also has a Peirce e-mail address where you can contact her. Both Norman and Jasmine came to us through WorkReady Philadelphia, a program administered by the Philadelphia Youth Network (PYN), which is one of the organizations that Mayor Nutter works with in his education initiatives. As we’ve talked about in the past, Peirce is fully committed to Mayor Nutter’s educational goals for the City. So when he was looking for colleges and universities to open their doors to young people with internship opportunities, we felt it was a great chance to take action. PYN provides career and college preparation courses and links thousands of students with internships and job opportunities in the Philadelphia region. WorkReady connects PYN’s partner organizations with intern candidates that match each organization’s needs and interests with those of the candidate. A lot of what we do here in the CDS department for current Peirce students is built upon the recognition of the value of internships. We call these “experiential programs” because they involve partnering with external organizations to offer hands on experience in the business world. We also recognized that we have great opportunities here at Peirce for external students, which inspired us to connect with PYN and WorkReady and build the foundation for our formal internship program. We have several goals in mind for this internship program. First and foremost, it is about empowering young people. We want to make sure that we are aiding in the professional development of students within the Philadelphia region by giving them those hands-on opportunities we feel are so important. Second, we’re specifically looking for high school students and college students. We recognize that it is especially challenging for them to get real-world experience, and know that we can be a conduit for that kind of experience gathering. At the same time, it’s a win-win! Peirce gets an extra set of hands, and more importantly, a fresh set of eyes. We get the creativity and perspective that can only come from outside an organization! In addition to their main tasks, Norman and Jasmine will be assigned mentors, have weekly one-on-one meetings with me, and have the opportunity to attend “lunch and learns” where faculty and staff will share their own personal and professional journeys. We hope that all of these elements, combined with the core of who we are and how we operate, can provide them with a valuable overall learning experience. At the end of the internship, Norman and Jasmine will give formal presentations to their department as well as some senior managers. We’ll be asking them to reflect on the value of their internship, what their goals were for the experience, what they’ve learned, and what they will take forward. Part of our strategic plan calls for recruitment of more traditional students who are looking for a nontraditional experience. This is where the internship program will help Peirce grow and learn as well! We hope to take advantage of Norman and Jasmine’s insight, and encourage their input and feedback about what their peer group is looking for in a school like Peirce, and what we can do better to reach them. At the end of the day, we try to remind our students that whether it’s paid or unpaid, they should take a look at the real value of an internship. It’s not so much about the money, but the experience they’re going to get and how it will make them even more competitive candidates in the marketplace. Norman and Jasmine should be an example to all current Peirce students of how valuable an internship can be. I know they remind me every day why we are here and doing what we do.